My short story The Puppeteer has made it onto the pages of the tastily named Toasted Cheese lit mag’s September issue. I am very excited about this! 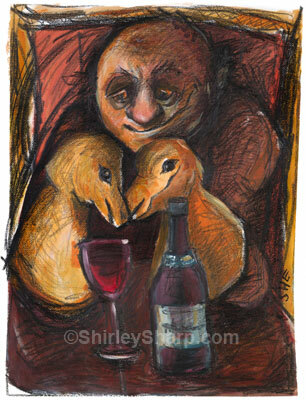 The Puppeteer is a rather sad but ultimately hopeful story that was initially prompted by this amazing painting by artist Shirley Sharp. (published here with her permission). The characters populating Shirley’s canvasses often have a somewhat melancholy air, which gave me the first seeds of my protagonist Peter’s personality. Then I needed to make sense of the two creatures apparently sitting on his hands, and suddenly the idea came to mind of a puppeteer who’d lost his family through his obsession for his craft. Thanks for the inspiration, Shirley. He tried not to feel their bewilderment, not to hear their shrieks of fear, as the flames sent acrid, choking smoke into the night sky and made a dark scorched circle on the grass. Tears streamed down his sooty face, and he told himself he was committing some kind of sacred act; a magician’s trick to bring his wife and Pippa home to him, prove how little hold the puppets had over him, compared to his love for the two of them. I’ll be teaching a workshop on writing from art at the Bristol studio of sculptor Carol Peace on Wednesday 12 November from 2-5pm. Find out more here.